We’ve been back for a few weeks. There was a lot to catch up on our lives here in California. We crossed paths with your trip leader, Tom, at Col Forlaz. And met your solo client Carol from El Paso at Cab Louvie. We hiked with Carol for 4 days until Grimentz. Then ran across her again when we got to Zerematt. We were able to adjust our pace to our desires, and took the odd bus or Gondola to move ahead when we needed it. I especially liked the days in the back country, hiked between Verbier and Arolla. Cab Louvie and Cab Dix were standouts. And after a little hesitation, everyone (all 6 plus Carol) climbed the ladders up Pas de Chevre. We stayed at Hotel Weisshorn on 1 August, Swiss Confederation Day and were treated to fireworks down in Sierre and other lower villages, and a big fireworks display put on by the Weisshorn staff. The changes in hotels in Chamonix and St. Niklaus, went seamlessly. 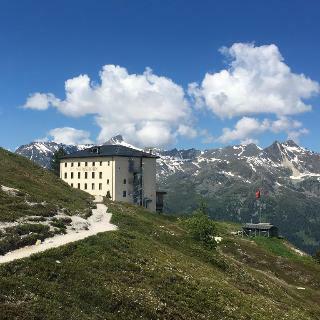 Even though we were long gone on the hike and never received your email regarding the St. Niklaus hotel change until return to the US , the hotel manager in St. Niklaus told us of the change and drove us to the other hotel, and it all occurred smoothly and without hassle. All 6 of us were ecstatic about the hike.